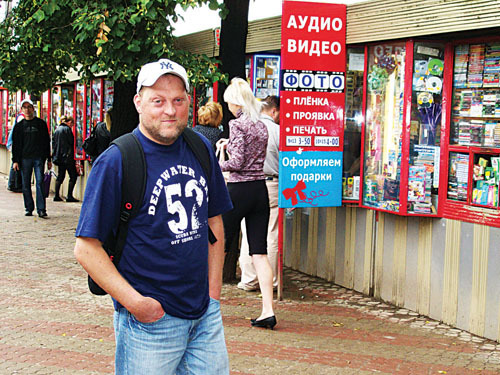 Igor Karagaov in his home city of Ivanovo. Is the world in the grip of a new Cold War? Should we fear Russia again as we did in the 1970s and 1980s? Many would think so given the growing unease in the Western world of a resurgent Russia under the former president and now prime minister Vladimir Putin. Russia’s long opposition to US plans to locate defence missiles in Eastern Europe, it’s links with Iran, and particularly it’s official recognition of South Ossetia and Abkhazia - who broke away from Georgia in August - has led many in the West to talk seriously about the world having entered a new Cold War. Almost 20 years after the fall of Communism, Russia is suddenly back as the West’s official enemy. Russians, however, see things very differently. They make no apologies for their country’s stance on these issues but neither are they interested in belligerence, and have little time for talk of a ‘new Cold War’. On Tuesday morning I met with Galway-based Russian Igor Karaganov to get an insight into how Russia views the world and what Russians make of how the world views them. Igor is originally from Ivanovo, a city of half a million people, some 300km from the Russian capital Moscow. He and his wife have been living and working in Galway since 2001 and Igor is currently studying IT and German in NUI, Galway. We begin by talking about August’s Russian-Georgian conflict. Igor suspects American and British interest in accessing or controlling Russian natural resources as motivating media portrayals of Russia as ‘the enemy’. He dismisses any notion that there is such a thing as a ‘new Cold War’. At the centre of all focus on Russia is prime minister Vladimir Putin - the most important figure in Russian politics since coming to power in 1999. For the West Putin is a strange, sinister figure. A former KGB man who is now an authoritarian leader, fashioning a one party-state with a tightly controlled and muzzled media, and pursuing, not a militaristic, but certainly an aggressive foreign policy. For Russians though, Putin is a hero, a strong man leading his country out of the darkness of the 1990s into prosperity and a position of global influence. What accounts for this view? “You have to start with Mikhail Gorbachev,” explains Igor. “Gorbachev recently got a medal for freedom from George W Bush. For the West he is a good guy, but in Russia he is hated as he destroyed what was a powerful country. “Then Yeltsin came and he spent most of his time being drunk and giving away our natural resources as bribes. Yeltsin said he was a democrat but what did Russia get from democracy? Poverty, homlessness...it was a very grim situation in Russia. It’s why Russians now have a sceptical view of democracy and are not convinced it’s such a great system. “Then Putin came to power. During his presidency monthly salaries increased from €50 to €700. Russia has brought 1,600,000 cars in the first six months of this year. It’s Europe’s main car buyer. Russians now have access to loans and mortgages and are buying apartments. It’s a good economic situation. Economic and political stability is a theme Igor comes back to again and again. For Russians these are the most important things. Given the country’s history under the Tsars and the Communists, perhaps Russians prefer strong, authoritarian leaders. What about charges that under Putin there is media censorship and a clampdown on any criticism of the government? Putin has also attracted controversy by his opposition to US plans to develop an anti-missile system in Eastern Europe. Nonetheless Igor does not envisage Russia and the West growing more antagonistic towards each other, but feels that mutual interests and needs will bring about international co-operation.